Nugget said it will be a slow recovery, but there is no way his experience is going to keep him out of the water. Image Supplied/Stuff. The Whangarei surfer who survived a great white shark bite faces a second round of surgery on Sunday to determine the damage to his arm. 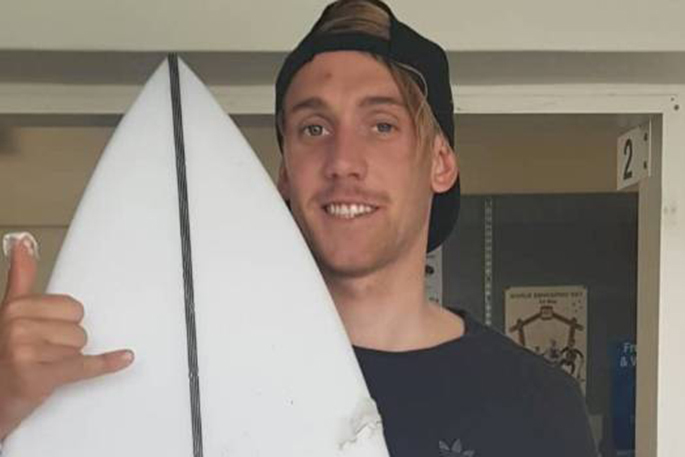 Andrew "Nugget" Brough, 25, was attacked by the shark around 6pm on Friday at Baylys Beach near Dargaville. Andrew says on Sunday morning he was facing a slow recovery, but there was no way the traumatic event would keep him out of the water. He also doesn't blame the shark at all. But the incident did ruin his long-weekend plans for fishing. "I don't hold it against the shark. You go into their territory and know the risks." The great white shark's bite punctured his forearm and his hand. He says the puncture wound to his hand could fit his finger. Surgeons used 12 litres of water to clean the wounds out for infection and on Sunday he was waiting for a second surgery to check for nerve and tendon damage. Andrew says it was hard to explain what actually happened when he, his mate and two other guys were out surfing on Friday. "I got hit, hit in the face," he says. Then it was "like someone hit pause on time" and he thought: "Why is someone hitting me in the face?" he says. At that point, he didn't even realise it was a shark. "But then someone pushed play again, and the shark rolled over and flipped its tail out of the water and starting thrashing under my board," he says. Then adrenaline kicked in, and he started paddling, the fastest he's ever paddled, the some 150 metres back to shore. He says he kept screaming "Get out of the water" as his way of keeping his adrenaline going. "My arm did feel sore but my wetsuit had it compressed a bit. "But there was blood all through the water. I thought: 'I'm in trouble here'." When Andrew made it ashore, the reality and the pain hit him. "While I was in the chopper, I called my fiance, I had to tell her everything was OK. I knew I was going to live but I had to tell her: I've been attacked by a shark." The lucky-to-be-alive surfer says the west coast was renowned for sharks but not shark attacks. "It's unheard of (to have) shark attacks in Northland. I've been in the surf with orca before, that's why it didn't process at the time [it was a shark]. "I was lucky but unlucky. "I'll be stuck in a solid cast for two weeks, and a slow rehab to get the muscles going," he says. "I'll definitely be back in the water, I love fishing, diving, surfing. "Let it be known, I knew the risks. I've got nothing against sharks. It's their territory." On Saturday, surfers had already returned to the water at Baylys Beach to enjoy the long weekend, and shark scientist Riley Elliott says there was no reason for beach-goers to be worried of more attacks.